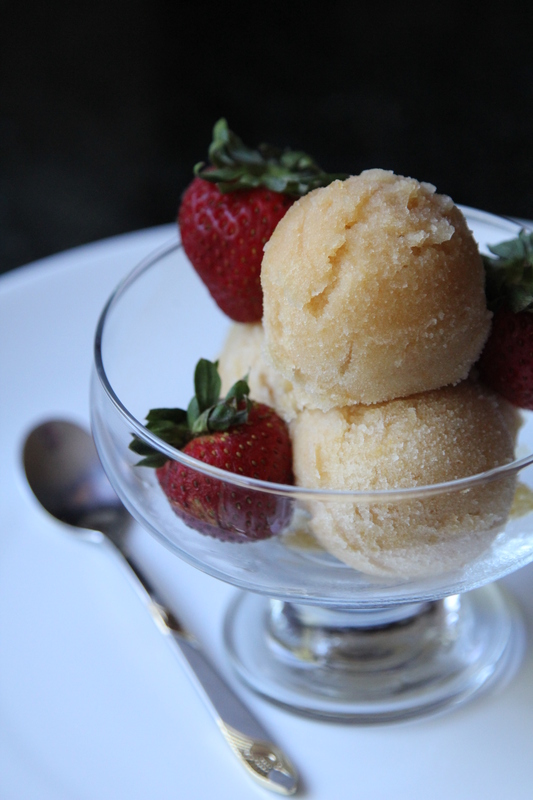 Peach Iced Tea Sorbet [recipe] – Cin Cin, Let's Eat! Peach used to be one of my all time favorite fruits…well, technically it still is, except when I was 15 I developed an allergy to this pitted fruit along with quite a few other items like cherries and kiwis. But I also discovered that I am only allergic to these fruits in their fresh form, once it’s cooked or processed, they are perfectly fine to ingest. Weird huh? My parents have a peach tree so my fruit bowls are usually stocked with peaches in the summer. Unfortunately, I am not a big fan of peach cobblers but a few personal favorite ways to enjoy these summer fruits are: barbecued (with a big scoop of vanilla ice cream), jam/preserves spread, fruity sangria, pureed for delicious Bellinis, peach cakes, and of course, the refreshing peach sorbet. 1. Purée the peaches in a blender and strain through a fine-mesh sieve into a medium glass or metal bowl, pressing on the solids with a rubber spatula to remove as much liquid as possible. Discard the solids. You should have about 2 cups of purée. Add the tea, sugar, vodka, and corn syrup and stir until the sugar dissolves. Cover and refrigerate until the mixture is very cold (under 40°F), at least 4 hours, then mix well. 2. Churn the sorbet in an ice cream maker according to the manufacturer’s instructions. 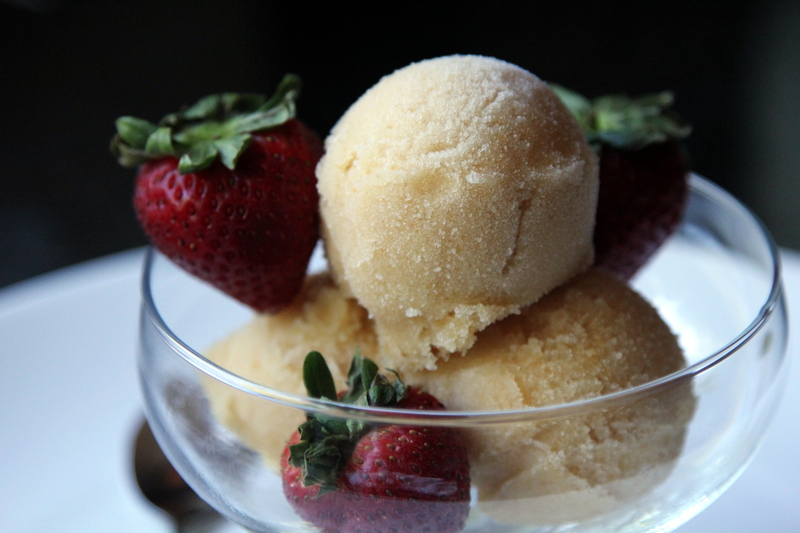 When finished, the sorbet will be thick and soft and can be served as a slushy. To make the sorbet firm enough to scoop, transfer into an airtight container, press plastic wrap directly onto the surface of the sorbet, and freeze until firm. 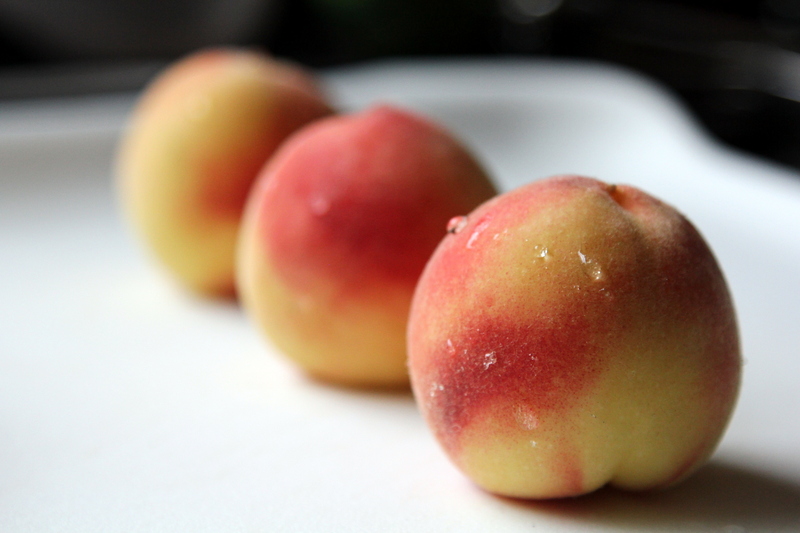 Note: Peaches oxidize fairly quickly… and especially after adding the black tea, the mixture can look very dark. Don’t worry, after the churning process and frozen solid in the freezer, the color will be much lighter. Sweet tea vodka… yes please! This looks awesome. thanks for sharing, it was deeeelicious! Where do you get sweet tea vodka? Nice touch with the water droplets on your peach!